Draft wood combines horse powered logging and restorative forestry practices. Our goal is to make beautiful, healthy, and ecologically productive woods. Buying these products makes you a partner in achieving this goal. Horse logging using worst-first single tree selection is called “restorative forestry”. This method looks closely at each individual tree to determine which ones to harvest. Trees damaged by previous skidding, disease, fire, over-crowding, or weather are removed first. Every tree that is cut is carefully felled to avoid damaging other remaining trees with high value potential. Restorative forestry has been found to increase the amount of high quality commercial timber taken from a given site over time. Crop tree management focuses on releasing individual, selected trees to maximize their growth by removing nearby diseased and damaged trees. Research conducted on hardwoods in West Virginia (Perkey, Wikins, and Smith, USDA Forest Service, January 1994) indicates that a crop tree “free to grow” may increase in diamter 2-3 times more rapidly than unmanaged stands. Our harvest techniques can provide income to the landowner every 10-20 years. It is an ongoing management system rather than total clearcut harvest rotation every 75 years. We use horses to pull logs from the forest providing a low-impact, uniquely sourced product. Horses don’t cause soil compaction nor rutted skid roads that are often associated with large machines. Trees have numerous roots close to the surface of the ground hat are easily damaged by heavy machinery. Horses have greater maneuverability and are able to make tight turns without damaging trees. Our method of selecting individual trees on a “worst first” basis improves the quality of the trees in a given forest. Limiting removal to no more than 30% maintains the forested condition. Creating small pockets in the forest where light can get to the ground allows natural regeneration of a range of tree species. We believe Draftwood standards exceed every other standard in the industry, including Forest Stewardship Counsel (FSC) and Sustainable Forestry Initiative (SFI). Our products are guaranteed to have been harvested under Draftwood Principles, Criteria and Guidelines. Draftwood Green Certified Forest Products have been used in L.E.E.D building projects. Chad Vogel has 15 years of experience logging with horses. 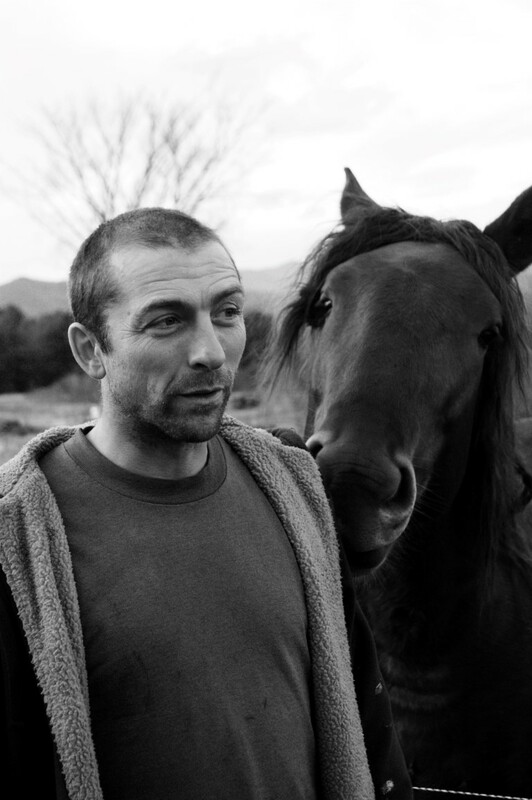 His craft is creating beautiful productive forest and training horses to work well as a team. To Chad's left is Donn, our resident stud horse for the breeding at Reber Rock Farm.